TAG, YOU'RE IT The OSIRIS-REx spacecraft has caught up with asteroid Bennu, shown in an image taken November 16. The probe will use a touch-and-go maneuver to grab up to two kilograms of sand and dust from the space rock. A spacecraft designed to pick up pieces of an asteroid and bring them back to Earth has finally reached its destination. After a two-year journey, NASA's OSIRIS-REx spacecraft caught up with asteroid Bennu, currently located nearly 130 million kilometers from Earth, on December 3. "We have arrived!" Javier Cerna, a telecommunications systems engineer with aerospace and defense company Lockheed Martin in Littleton, Colo., announced when the spacecraft signal came through. At just 500 meters wide, Bennu is the smallest object ever to be "orbited" by a spacecraft. But the asteroid's slight gravity is too weak to keep OSIRIS-REx in a circular orbit the way a satellite might orbit a planet like Earth. So the spacecraft will perform a series of precision maneuvers to keep up with the asteroid. "It will really be record-breaking in terms of the precision navigation that we've done in space," said navigation engineer Coralie Adam of KinetX Aerospace, an Arizona-based engineering company. Over the next 18 months, OSIRIS-REx will map the asteroid with five scientific instruments and pick out the best spot to grab material from one of the oldest objects in the solar system. Planetary scientists think Bennu is a leftover remnant from the earliest days of the solar system, about 4.5 billion years ago. Remote observations have shown that the asteroid is rich in carbon, a necessary ingredient for life on Earth. Such asteroids could have brought organic molecules to Earth or other planetary bodies, and may hold the key to understanding the origins of life. But scientists need samples from such asteroids as Bennu to figure that out. OSIRIS-REx will use an instrument called TAGSAM, short for Touch-And-Go Sample Acquisition Mechanism, to pick up 60 grams to two kilograms of dust and sand from Bennu's surface. That sample will be the largest returned from space since the Apollo missions to the moon in the 1970s, and the largest ever picked up by a robot. The probe will collect the material in 2020 and return it to Earth in 2023. "Our science team is very eager to study this material that we’ll get back from Bennu," said OSIRIS-REx project manager Rich Burns of NASA's Goddard Space Flight Center in Greenbelt, Md. "This is material that's been around since the beginning of the solar system." OSIRIS-REx is the first U.S. sample return mission to an asteroid, but not the first such mission overall. Japan's Hayabusa mission returned a tiny amount of asteroid Itokawa to Earth in 2010 (SN Online: 6/14/10). 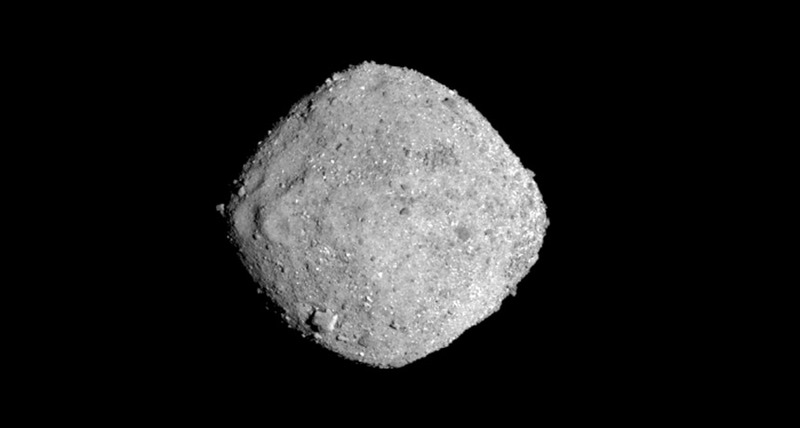 The follow-up mission, Hayabusa2, reached asteroid Ryugu in June and will return samples of that asteroid in 2020 (SN Online: 6/27/18).